Should You Update Your Device Drivers? Let's start by defining the term. Device drivers, more commonly called "drivers," are small programs that act as translators between your operating system and the hardware devices it uses. Every hardware device needs a driver. Your printer, scanner, mouse, keyboard, hard drive, sound card and network adapter are all examples of devices that require a software driver in order to respond to commands from the operating system. For example, when you hit the Print button, Windows issues the generic command "print," and a device driver translates that command into the specific instructions needed by your particular make and model of printer. Device drivers are typically supplied by the hardware vendor. You've probably had the experience of purchasing a printer or mouse, and being prompted to insert a "setup CD". That disk contains the software and drivers needed to enable your device to communicate with Windows. Windows also comes with a vast library of drivers. When Windows is installed, it scans your computer for attached devices and tries to match them with drivers from its library. Likewise, when you plug a new device into a Windows system, Windows looks for an appropriate driver in its library. If the right driver for a device is not in Windows' library, you will be prompted to supply it (typically, on a CD included with your hardware device). Install the driver and you're done, right? Well, not always. Hardware makers do issue updated drivers occasionally. Whether you install them or not is up to you. Let's be clear about one thing -- those popups on your screen are ads, not dire warnings from your computer's operating system. They're pushing software that scans your computer, looking for device drivers that may need to be updated. Some of these products are outright scams or malware in disguise. Others are semi-legit, but misleading. The phone calls warning about missing or outdated drivers are DEFINITELY scams. See my recent article [ALERT] Fake Tech Support Scammers Are Calling for more on that. Do I Really Need This Driver? If you've determined that you absolutely need to update one or more of your device drivers, I strongly urge you to use System Restore to create a restore point first. Then if anything goes wrong, you can undo the update. It's also a good idea to make a full system backup, in case you have a hard drive failure which requires re-installing Windows from scratch. Most driver updates are performance enhancers. They may fix minor but irritating glitches in previous versions. Often, these glitches are so minor that they pertain only to particular PC models and do not affect the majority of users. Sometimes you'll need to update a device driver if you move to a newer operating system. For example, you might have a printer or scanner that worked fine under Windows XP or Windows 7. You upgrade to Windows 10, and now it doesn't work. Some other commonly reported problems are no sound, or problems with screen resolution. A quick trip to the vendor's website should help you find a driver written specifically for that device and operating system. In most cases, you will simply download and run an EXE file to install the new driver, then restart your computer. If that's not the case, look for instructions on the vendor's site. A few driver updates patch security vulnerabilities that might enable bad guys to infiltrate your computer - if they bothered to take advantage of the vulnerabilities. It's just not worth a hacker's time to write a virus targeting the driver for one of several thousand devices. Beside, security-related driver updates generally find their way automatically onto most users' systems via Windows Update. Some devices will even update themselves directly from the vendor website. Most people don't bother looking for driver updates unless they are having a problem with a hardware device. After all, it isn't broken, why fix it? By the way, Windows Device Manager is not a reliable indicator of whether your drivers are up to date. Device Manager tells you only whether a driver is working, not whether it's the latest and greatest version. One "edge case" is when you need an OLDER driver for a piece of equipment. In my article HP Playing Dirty Tricks? I described a situation where my HP inkjet printer was rendered useless by an automatic update from HP. The new driver would not allow me to use third-party refilled ink cartridges, claiming they were “damaged.” I fixed the problem by rolling back that update, and installing an older driver that did not require “new and genuine HP” cartridges. There are many so-called "driver updaters" or "driver boosters" available online. These programs scan your system's drivers, tell you which ones are out of date, and offer to fetch and install the latest drivers for you. Sounds neat, until you realize there's a fee for all of this. Then you may also realize that you have no way of knowing whether the drivers installed by such services are really the correct drivers, the latest ones, or even if they are malware in disguise. If you do need an updated device driver, don't just Google the name of your device and download a new driver from the first website that pops up. Aside from Windows Update, the only trustworthy source of drivers is the support website of the hardware manufacturer. 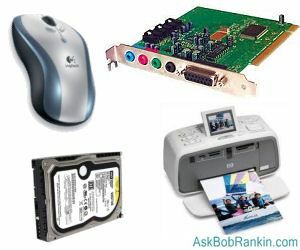 Here's my bottom line on driver updates: If you are having an issue with a printer, scanner, mouse, keyboard or other peripheral device, look for a more recent driver on the maker's site. But updating drivers just for the sake of "keeping current" is not worth the effort, and may do more harm than good. Most recent comments on "[ALERT] Should You Update Your Drivers?" I agree, "If it ain't broke, don't fix it." Many times the mfgr install file includes a repeating routine to check for updates and to start at boot. Sometimes this update check is shockingly frequently. And, who needs their mfgr printer app to start at boot. This irritates me to no end. Sometimes it takes lots of time to find how to disable this. I use AVG (lifetime purchase a few years ago) and keep getting irritating pop-ups wanting to sell me a "driver update" program. Was it you who said that AVG has become just another sales site or something to that effect? I agree completely. I get tired of their constant advertisements and any third party site advertising updaters is at best a waste of money and effort. Thanks, Bob, for an occasional reminder! I have printers made by OKI, Canon, Lexmark and Brother. Each came with a setup CD which also contained several 'useful' extra apps as well as the drivers. Checking the manufacturers' websites occasionally has produced updates for all the extras, but I don't recall the drivers themselves needing updating. I also use PC Pitstop's PC-Matic which checks for outdated drivers, and that's never reported them needing updating. I do occasionally get an mail from AMD telling me of improvements to my graphics card driver, but on a non-gaming laptop it hardly seems critical - though if THEY tell me to upgrade, I'll do it. Generally, it seems, the manufacturers get the driver right first time, but a visit to his website occasionally won't harm. Just don't believe emails promising you the world for nothing. As Robert Heinlein used to say, TANSTAAFL - there ain't no such thing as a free lunch! i've always used file hippo, and never had problems using them for years!!! I should have read your post before I took the first driver website to pop-up. After that my AVG refused to go there because it said there was a Trojan. So, minimizing driver updates and finding the manufacturers website is now all I will do. I learned years ago to register my components with the company that made them ... I will then get periodically notices from those companies to update my drivers. The companies know when there is a new driver for their own products. For example ... I have an Nvidia Graphics Card and I do get periodical notices to update. I go to the Nvidia website and download which driver is best for my Graphic Card. I have an older Graphics Card by Nvidia, so I don't have to update very often, anymore. I have done this with my Logitech keyboards and mice, my Printers and so on. It is the safest way to prevent having Trojans, Viruses, and all sorts of Malware by using any other method to update my drivers. The company that makes the various components are the safest way to update any driver. Using other means to get your updates can be sketchy at best. It only takes one time getting a Malware Update from any other means than the company ... To learn your lesson and it is a hard one to learn. Popups can be the worse of the lot when it comes to "fixing" your PC or Laptop. I don't even trust my own security malware programs for updating drivers. Should they say that I need updating my drivers ... I will always go to the component's website to get the real thing. It is called being safe and secure. Dell.com has some reputable tools as well. Driver updates can cause new problems... A graphics card driver update caused my HDMI monitor output to stop working. I rolled back the original driver and all was fine. Driver updates don't seem necessary if everything is working well. Bob, you're on the ball. Great advice. Microsoft is the biggest offender, it seems, when it comes to pushing updates, whether or not you want them. A recent one in Win 7 and 10 screwed up network connections, and a workaround still hasn't been forthcoming. Good timing to remind us all. These driver update programs are a scam IMHO - as you say windows has any needed and as reader said - can go to manufactuer of the device you use if need to update a driver. But also drivers can be the problem - now I did find a driver program on a computer of a friend in trouble and it works - not the culprit - called Driver Booster. Yes nags to pay for Pro. Avast nags me rigid - like AVG seemingly. Bob read Kapersky total is best package encompassing needs in today's greedy world - have you done a test for best yourself? I have an old HP printer that keeps giving me a paper jam error. Does this sound like it could be a driver issue? I'm not sure that it is but I thought that I would ask. Any thoughts? EDITOR'S NOTE: Assuming it's actually jamming, seems more likely that it's just a hardware issue. Try cleaning the rollers inside the machine. Agreed! I NEVER pay attention to popups, because most of that is nothing but gimmicks. In addition, for most of my browsers, I disable popups. I agree that if it is not broken, there is no need to "fix" it. With that said, on those rare occasions I require a driver, I go to the vendor's website. [There may be very few trusted sites, such as File Hippo.] It is very wise to treat those popup sites as a potential for downloading malware. Thank you for the very sound advice! I use Iobit products including their uninstaller, Advanced System Care and Driver Booster. I update my drivers when Driver Booster advises that there is an update and I have never had a problem. BTW - I was having problems with ASC until Bitdefender (my AV program) told me to uninstall Malwarebytes. Since then I haven't had a problem. Bob - absoluuuutely right, don't update drivers unless there's a prob, and go direct to the manufacturer - can be tedious, with Nvidia, say, but worth the effort. Bob, Thanks for a great article. I have always been pretty proactive about updating drivers because I thought you need to for better performance. Knowing now that it's usually just minor tweaks and if it's working leave it alone, I will do just that. I have gone to manufacturers usually though, and I tend to find them very confusing at best. I have popped the case on my desktop before, just to get the full part number plus revision, plus series, etc. in order to make sure I get the right driver. Not so easy on a laptop so I have to go to HP and see what they say my computer has in it. Then again, HP does a fair job of having drivers on their site. Again, it involves turning the laptop over and trying to figure out which of those numbers is the right one. On another note, I have literally thrown an HP printer into the dumpster, (only to have to go diving since it is not considered landfill waste, and I was at work. They are the most ridiculously unmanageable printers ever devised and I absolutely will not own one, ever. I would not even take one for free, as I can hit myself in the head with a hammer and the headache will be of limited duration. Not so with an HP printer. 100s of hours (literally) just trying to get it to print a few reports, and pictures.